Caught in a catch 22? Don’t want to commit to employing someone? We are the solution – and it won’t just save you money, it will free up your time to increase sales and turnover. Getting bogged down in your business admin is a costly exercise – it’s a major source of stress and will hold the business back from achieving it’s true potential. 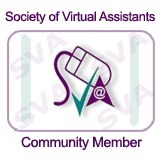 Our virtual admin services offer everything an in-house PA can – and more! We cover all aspects of business and personal admin with swift completion and a reliable, versatile service. There are no fixed costs; you pay for what you need, when you need it. Our team can cover a huge range of tasks with minimal handover, meaning a highly efficient use of time and great value for money. We support your business by letting you get back to what matters, and as your business grows, we’ll grow with you. *To calculate the cost to your business you need to consider not only the salary you will offer, but all the additional costs (oncosts), such as NI, pension contributions and covering sickness / holiday. Then there’s the provision of equipment, hardware, software, office space and sundry items – all of which can easily reach £20k+ per year, on top of the salary itself. The quality of work done was excellent. It was also completed in a timely manner and very cost effective. A service I shall recommend and utilise in the future. Our Business Development Training was delivered by Julia Cheeseman, from Starfish Admin Services. A truly interactive session, it certainly got the brain going! One of Julia's top tips was to analyse how much time you are spending on your admin and she gave each of us a handout with a guide on how to calculate this. It's shocking actually - I probably need a full time PA to release my time to spend on income generating activities! What did you find out when you calculated yours? Well we know who to call for help now! Starfish services gave me quick and accurate administration support to enable me to market my services efficiently. I have since gone on to win new business as a result of the services offered by Starfish and I am talking to them about another service I need.